Classic Thai flavors of ginger, peanut, and lime infuse and transform the button mushrooms in this fresh-tasting, healthy salad. In a large skillet heat oil until hot. Add garlic and ginger; cook and stir over medium heat until fragrant, about 1 minute. Add mushrooms; cook and stir until tender and pale gold, 3 to 5 minutes. Stir in salt and pepper; set aside. Toss salad greens with Lime Jalapeño Salsa. 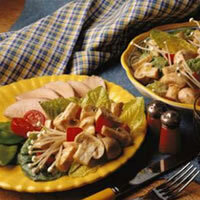 On 6 serving plates, place an equal amount of salad greens and top with mushroom mixture. Sprinkle with toasted sesame seeds, if desired. To make Lime-Jalapeño Salsa, combine jalapeño peppers, cilantro, basil, mint, sugar, soy sauce, lime peel and juice. Whisk in olive oil to combine. Stir in cucumber.